← Rename Yawkey Way: yea or nay? It was June 1990, Severance Green at Wellesley College. Blue sky, warm sunshine, graduating seniors and their families waiting to hear from two commencement honorees, Raisa Gorbachev, the wife of Russian premier Mikhail Gorbachev, and Barbara Bush, First Lady, wife of President George H. W. Bush. Local press and national networks were there to cover the event. The following weekend, at the very same place, I would attend my class reunion, but on June 1st, I was at commencement in my role as WCVB-TV editorial director, to provide commentary to anchors Natalie Jacobson and Chet Curtis. I had just returned from a month in Eastern Europe and the Soviet Union, where, with editorialists from some of the nation’s leading newspapers and networks, we had interviewed government and opposition leaders, students and labor activists. It was a time of optimism. The Berlin Wall had come down, and the unified city was holding its first elections. Soviet puppet governments were overthrown. In Moscow, we watched as Boris Yeltsin was named head of the Russian Supreme Soviet. In Bucharest, we visited polling places as Romanians waited hours in line to choose a replacement for dictator Nicholae Ceaucescu. And at Wellesley, 150 students were protesting that Barbara Bush should not be speaking because she was simply being recognized due to the achievements of her husband. But she was more than that, as we often saw when she differed publicly from her husband’s positions on social issues like abortion and gay rights. Bush didn’t dodge the feminist dilemma raised by Wellesley’s protesters. The woman whose children called her “the enforcer” spoke of the importance of family as a foundation of society. She spoke of her work on literacy and her belief that the ability to read was step one in solving the world’s problems. She urged graduating seniors to cherish their human connections, without which life had little meaning. There was, she said, no one right path to fulfillment as a woman. At the end she won them all over when she said, “Who knows? Somewhere out in this audience may even be someone who will one day follow in my footsteps and preside over the White House as the president’s spouse, and I wish him well.” She received a standing ovation. Gorbachev, a former college professor, who had taken a career path, spoke about the mission of “peacemaking, humanism, mercy and kindness” and promoting understanding among nations. The messages of the homemaker/volunteer and the professor/career woman were not that different. But behind the scenes, there was another story, told to me by a college administrator. Wellesley had prepared refreshments for the two women. Gorbachev, the woman from a self-proclaimed classless society, refused to partake in the same room as her staff. 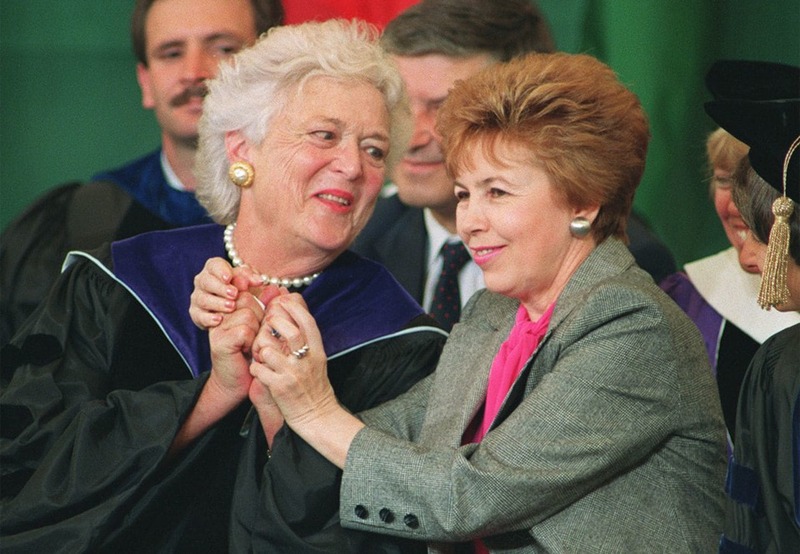 Bush, the matriarch of an American dynasty, happily shared arrangements with hers. In the wake of her death, we hear Barbara Bush praised for her “authenticity.” Substitute the words “down to earth,” which is yet another reason she was widely admired. She was a woman in her own right, not just an appendage to her powerful husband of 73 years. This entry was posted in Media, Politics, Uncategorized and tagged Barbara Bush, Raisa Gorbachev, Students protest Barbara Bush at commencement, Wellesley College commencement. Bookmark the permalink. What a wonderful piece. Thank you for sharing your memories of that day–such a lovely and genuine tribute to Barbara Bush.